From the Ukraine to New Zealand to Cuba, teenage girls talk about cell phones, outer space, Harry Potter, divorce, pets, favorite jeans, the Internet, and Spaghettios. International lawyer Starla Henrichs-Cohen Griffin 88C has traveled for much of her adult life. She spent her junior year in Paris as an international studies major; taught in Hitachi through the Japan Exchange and Teaching program; went to law school in Washington, D.C.; attended the University of Bologna in Italy; and was based in Paris and New York for an international finance group. Now living in London with her Irish husband, Peter, who is an international arbitration lawyer, Griffin works for the Emerging Markets Traders Association. The detailed profiles of more than forty girls include a brief biography (nationality, religion, languages, siblings, pets, hobbies, favorite sport, book, food, and possession), plenty of photos from their daily lives, and letters or essays written by the girls themselves, as well as thought-provoking questions such as: What do you think of the United States? What do you talk about with friends? What do you want other girls your age to know? Griffin found her subjects by asking everyone she knew with contacts in different countries if they had a thirteen-year-old daughter, niece, cousin, or friend. Her own thirteen-year-old niece, Kirsten, was included as one of three Americans. After emailing or exchanging letters, Griffin often traveled to a girl’s home to meet her in person. “The families were amazing and so welcoming to me. The parents would sometimes say I knew more about their daughters than they did,” says Griffin. Many of the girls shared quite personal feelings. One talked about her parents’ divorce; another of her fears for the future. 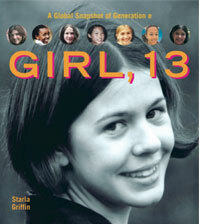 Girl, 13 was named a finalist in ForeWord Magazine’s Book of the Year for young adult nonfiction, and girls continue to write in to the website (www.hylaspublishing.com/girl13.html). The inspiration for the book to be about real girls sharing their stories came from Griffin’s own middle-school years. As the mother of a two-year-old son, Tobias, Griffin may be writing a Boy, 13 version as well, in a decade or so.—M.J.L.